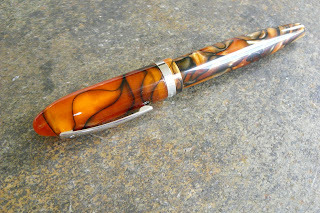 Soon after I started collecting fountain pens, I bid on but lost a beautiful striped Sheaffer Balance Over Size. In fact, I told the sad story here, two years ago. Since then, I have had my eye out for a good pen with a wide girth. Back in July my mom gave me cash for my birthday, so that I could find my own present - $1 for each year, or $50. Thanks, mom! Case in point, the Swisher Attic had a number of Laban Mento's in all colors and nib sizes this summer for less than $50. Before I could get my order in my first color choice was already gone. Good thing, too. Because it couldn't have been as nice as my second choice: Tiger Pearl. The photos can't do it justice. The depth of color and iridescence is stunning. The Laban Mento is by far the largest fountain pen that I have. It is the size of a large cigar. While it is not a Shaeffer Balance OS, it certainly qualifies as an OS pen. Before I bought it, I noted two complaints on FPN about the Mento: (1) scratchy nibs, unless you bought the gold nib version, which I didn't; (2) the nib dries out because of holes where the clip mounts. I had to gamble on the fine point steel nib because the gold nib doubled the price. However, I was not disappointed. I find it to be a very pleasant pen to write with. In fact, it is considerably less scratchy than some other steel fine points that I have. The light weight, wide girth and quality of the nib induce me to use this pen on a very regular basis. On the second point, the critics are right. The clip on the cap is poorly done. The clip is assembled onto the cap by two tabs bent back into the cap through two slits in the cap. This places two holes right at the tip of the nib of the pen and the nib dries out almost as rapidly as if you had no cap at all. However, I live in one of the most arid regions of California, so maybe it would be less of a problem in more humid regions. Even with the bad clip design, it has become one of my favorite pens, and I highly recommend it. At the beginning of 2010 I bought two pcs of Laban mento. One is Tger Pearl, second one is Pumpkin seed. One of my friends need so much tu buy tiger pearl. And I sold it. When I try the second one Pumpkin seed. It has a terrible scratchy nib. Returning a fountain pen from Turkey to US, completely disaster. Now I have an OS pen that I love so much but not functioning. 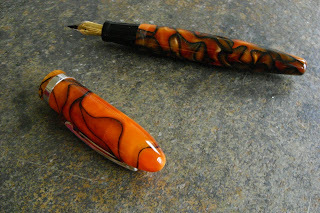 Also, nibs.com has articles on repairing and smoothing nibs. You can also get good info at the Fountain Pen Network.